Shami picked up a six-wicket haul. Indian fast bowler Mohammed Shami was stupendous in the fourth day of the opening Test against Australia at the new Perth Stadium. The pacer nipped out his best-bowling figures in Test cricket- 24-8-56-6. The incredible spell of bowling from the Bengal seamer helped India restrict the Aussies to 243 in their second innings and thereby limiting the target to 287. He picked his first wicket in the form of Usman Khawaja as Rishabh Pant took an impressive catch behind the wickets. In the last session of the third day’s play, he accounted for the wicket of Travis Head, who scored an impressive half-century in the first innings. However, his bowling masterclass in the post-lunch session of the fourth day was no less than inspiring. Immediately after the break, Shami got rid of Tim Paine, who scored 37 patient runs, with a vicious bouncer that got big on the batsman. Subsequently, Virat took a simple catch in the slip cordon. In the very next delivery, Shami got rid of the dangerous Aaron Finch for 25 runs. Finch came to bat after he retired hurt following a blow on the fingers by Shami itself. A couple of overs later, he sent Usman Khawaja, who churned out an essential knock of 72 runs from 213 balls with five boundaries, packing with another superlative delivery. 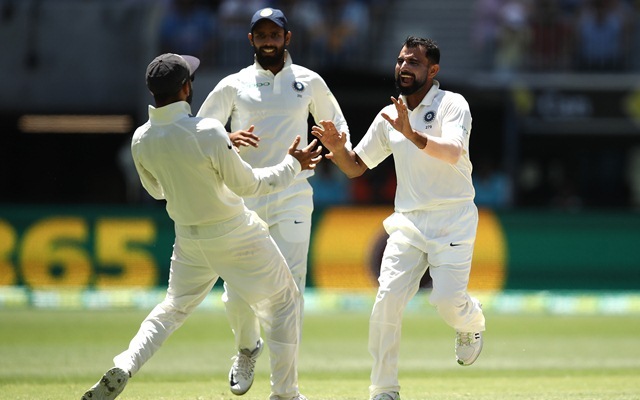 Shami picked up the six-fer, dismissing Nathan Lyon after which Mitchell Starc and Josh Hazlewood frustrated the Indians with a 36-run stand, which rubbed salts into the wounds of the visiting team.